It was my Birthday. I told Ty that he could help me make my cake. So we rolled out the fondant and Ty and Kenzie had a blast cutting out the shapes and putting them on the cake. I think that it turned out AWESOME!!! They did a great job. They might have pushed a little too hard in some places but that didn't affect how good it tasted. You are all wondering just how old I am, will I turned 35 this year. I don't feel any older. So that is a good thing I think. It was a normal day. Clean house, make a cake, go to lunch with Brad, Ty and Kenzie. Make dinner with Cortlyn's help. Go to two dance meetings for Shawnee. Come home, open presents, eat cake and ice cream and have dinner. Pretty eventful day? Pretty normal for me really. CRAZY, CRAZY, CRAZY. Loved all the Birthday wishes, and gifts from everyone. Thank you. Lucky the Leprechaun came to visit us again this year. He left a bag of Skittles for each of the kids and a saying that read. Have a Rainbow of Fun today. Love Lucky:) I made these sugar cookies for the kids. I left them on the counter and took Shawnee to a Dr appointment and when I got home the cookies were all gone. I asked Hayden and Cortlyn if they had ate the cookies and they said no but here is a note from Lucky. It read I have a treasure for you here is the first clue. Where do you rest your head? Where do you do your homework? Where do you keep the ice cream? Where do you watch movies? And the last clue was What room do you not go in very often? They found the treasure at the end Lucky's treasure was my cookies. He had taken them and hide them from us. That sneaky little Leprechaun. The kids were so excited for Lucky to visit us again. Ty kept saying that he saw him and kept going around the house to see if he had left anything else. Happy St. Patrick's Day. This is how we loaded the ranger with everyone in it for our rides. The girls giggled every time Brad hit a bump and they went flying off there seats. ( they were buckled up) Kenzie holding on for dead life if we went down a big hill and Ty with his hands in the air screaming more, more. Ty playing in the water at Sand Hallow in St. George. The water was a little cold but that didn't stop him from splashing around in it. Cortlyn and Lauren went all the way under the water and jumped back up cause the coldness of the water caught them a little off guard. Shawnee and Danielle doing cartwheels. They were not about to stay in the water. They didn't like it that much. They did go under once and that was all for them to get out and get a little sun on their not so tan bodies. Kenzie was the first to go for a swim, by accident of course. She was running in the water and tripped face first. Needless to say she didn't get back in the water. A little cold for the baby. Aren't these girls cute! These three are inseparable. They play so good together and very rarely do they fight. I consider them my own. Love ya Kate, Lauren and Cortlyn. One of the days we went for a ride and found this cool place to hike around. Everyone was loving it. 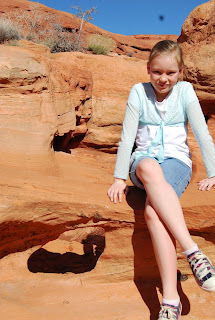 They had some cool rock formations and of course Cortlyn my little model wanted a picture at every one she found. 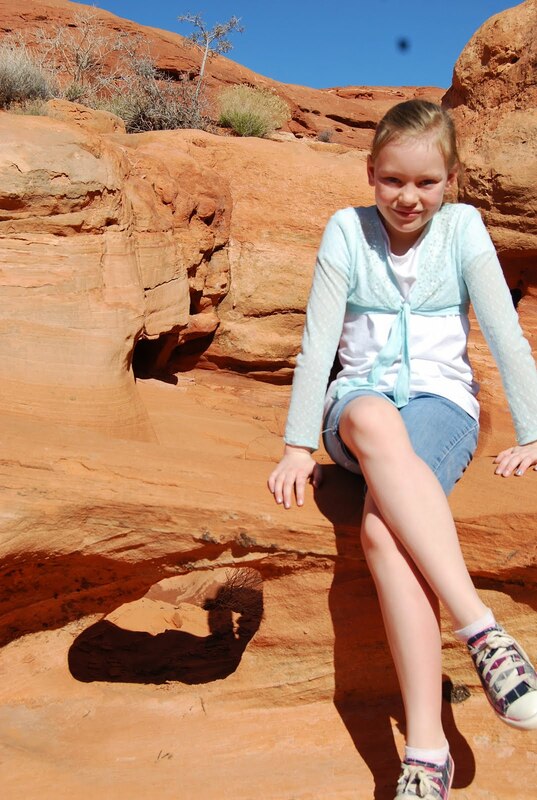 Here is one that she liked with the arch that she is sitting on and the hole to the left of her feet. Shawnee and here friend enjoyed the hike to. She is the little dot on the top of the rock. Kenzie got into it to. But enjoyed sliding down the rock better. Hayden in a cool cutout. The girls before they went to explore. We could have stayed there all day. 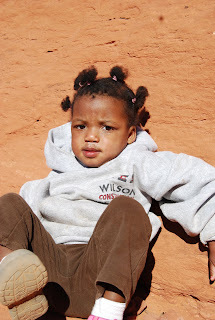 They was so much to do and see. Another day we took a 50 mile ride to see the Dinosaur tracks. Here is Ty pointing out one. He thought that this was the neatest place and was waiting for the dinosaurs to come. He was a little disappointed when we told him that they were all dead. The whole crew, at the dinosaur tracks. Shawnee being her silly self. 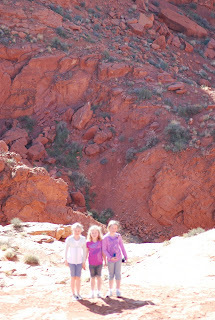 Shawnee and Danielle at the dinosaur tracks. They were just imprinted in the rocks behind them and they have preserved them. They are out in the open for all to see. You could see where they were going. There was a big print and a little print. We think that there was a mom and a baby walking. IT was pretty neat to see. On this same 50 mile ride we can to this cliff that looked over the valley. St. George is in the background. Same cliff. We had such a great time in the nice 75 degree weather in St. George. We didn't want to come home to the cold. As you can see we were in flip flops and shorts. So nice. 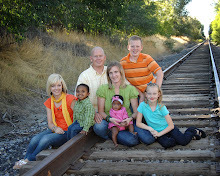 We went with some great friends the Panters and we can't wait to go back again and enjoy the sun, sand and water. Tell next time Sand Hallow. We will miss you. Stay off the road!!! 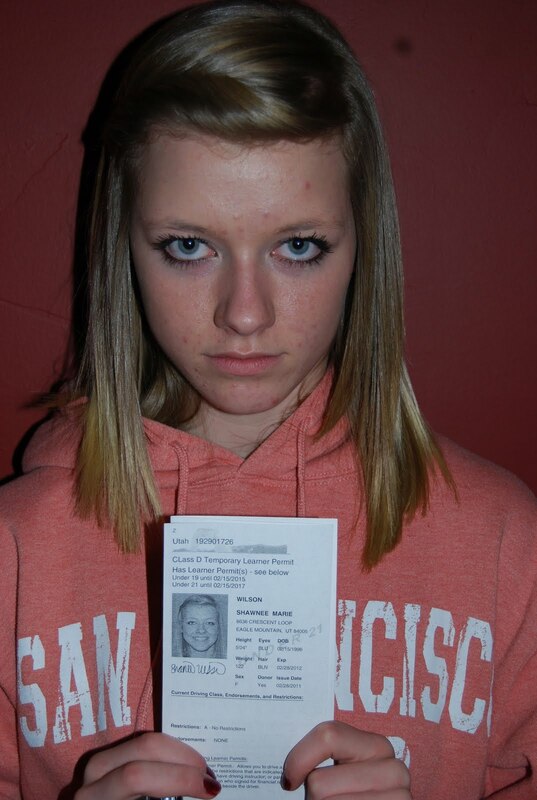 Shawnee has her permit to drive. This is a scary thing. Don't say I didn't warn you. This is a funny picture. She wanted it to look like she was getting her picture for a line up. The reason for the no smile. 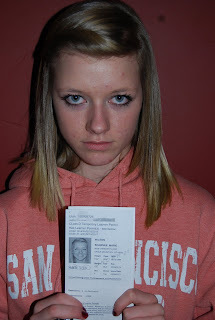 She was very happy to get her permit. She was lucky enough to drive home from the DMV on the freeway no less. Her dad was very brave. They made it home safe and sound. No sure that I am ready for this yet. She is growing up way to fast.